Orange Cedarwood - just sounds good alone! This is another of our original blends that has remained a favorite among all gender. A neutral blend of light orange citrus and a slightly sweet, woody scent. Both essential oils are known to be calming, and hold beneficial qualities for skin and hair. We've added molasses to create a rich lather and a warm, caramel color. Ingredients: Saponified coconut, palm, olive, soybean, grapeseed, and castor oils. Molasses, annato seed infused oil. 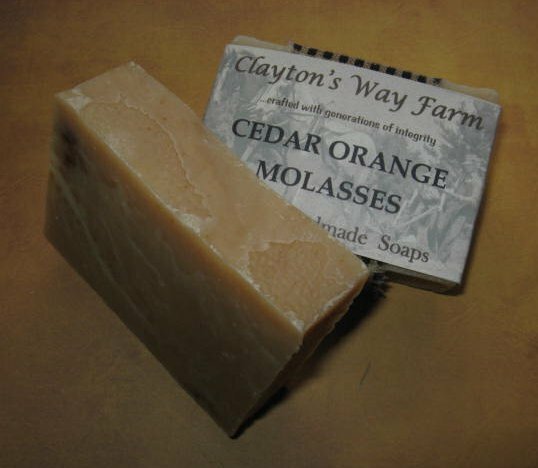 Cedar & orange essential oils.